Poblet Natural Site of National Interest (NSNI) is a protected natural area with a size of 2,460 ha situated in the province of Tarragona in the SW of Catalunya (41°17′34″N 1°02′42″E, Figure 1). It forms part of the Prades mountains, a large forested area of 26,000 hectare with both public and private ownership. In Poblet NSNI, two main types of landscape are clearly visible: in the Prades mountains, the relief is markedly mountainous (the Prelitoral mountain range) while the northernmost part of the NSNI is characterised by the flatter land around the Sec river valley (the Central Catalan Depression). The protected area is owned and managed by the regional government of Catalunya (Generalitat). Figure 1. Location of Poblet Natural Site of National Interest (abbreviated as PNIN in Catalan). Poblet NSNI is part of the administrative district of Conca de Barberà. The size of the district is 650.24 km2 and it is populated by 20,057 citizens (30.85 inhabitants/km2). Regarding the land use in this district, almost half of it is cultivated land, 27% of dense forest and most of the rest under shrubland. The regional economy depends on agriculture. The main products are cereals, vineyards, almond and hazelnut. The main crop is wheat, followed by barley. There is very little livestock. The climate of the Poblet area is typically Mediterranean, with some variations. There is a tendency towards a continental climate, and of course there are the logical effects of increasing altitude, which lead to a mid-mountain climate. The predominantly northern aspect of the Site also affects the climate. The average annual temperature is 13.2ºC and average annual rainfall is between 550 and 600 mm. The climate diagram indicates severe drought stress in the summer months July and August (figure 2). Figure 2. Climate characteristics of the weather station in Conca de Barberà district (source: Servei Meteorològic de Catalunya, Generalitat de Catalunya). 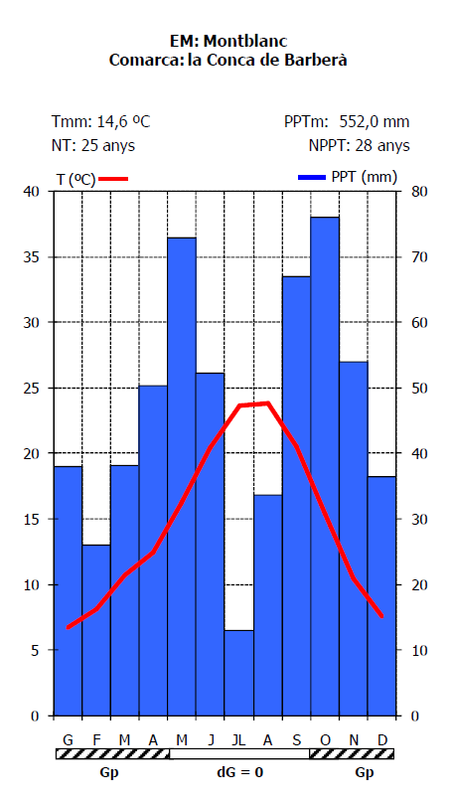 Climate change is expected to have an effect on temperature, but also on precipitation (figure 3). For the simulations used to optimize management under climate change for Poblet, hourly data for the next hundred years were produced by the Gotilwa+ weather generator using a regional climate model for Catalunya run for a climate scenario close to the SRES A1B (Barrera-Escoda and Cunillera 2010). The regional translation of this climate scenario predicts a 2.1 ppm/year increase in CO2, a 6.5°C/100 year increase in mean annual temperature, and a 30%/100 year decrease in annual precipitation. Figure 3 shows the evolution in precipitation over the next hundred years as simulated by the Gotilwa+ weather generator. 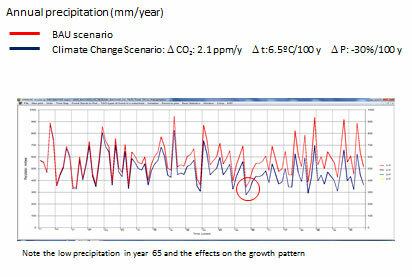 Figure 3: Evolution of precipitation (in mm/year) in Prades mountains as modelled with the Gotilwa+ weather generator. Note the low precipitation in year 65, which affects the growth of the forest. 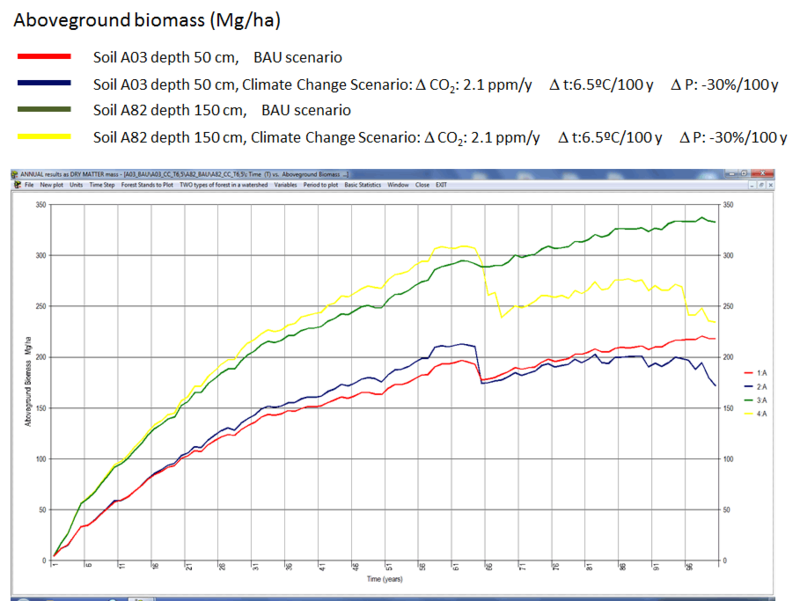 The altitude of the Natural Site varies between 400 m in the lowest parts and 1,201 m in the extreme SW of the protected area (Tossal de la Baltasana). The geology of the Site of Poblet is conditioned by the fact that it belongs both to the Prelitoral mountain range and the Central Catalan Depression. The two areas are separated by the Poblet fault, which runs roughly northeast to southwest. The small area within the Central Catalan Depression, in the lower part of the Site around Poblet Monastery, consists almost entirely of Quaternary materials of the same type as the terraces of Francolí. The prelitoral mountain area is made up of a Hercynian basement, consisting mainly of grey and black slate, quartz sandstone, sulphuric horizons, and conglomerates. Above the basement in some parts of the Site there are Triassic materials with dolomite and limestone. The forest of Poblet is an ancient forest which historically belonged to the nearby Cistercian monastery of Poblet. It is one of the best preserved forests in the Tarragona province. Thanks to its varied geology and rugged topography Poblet has a wide variety of plant communities in a relatively small area. The following forest types are well represented in the NSNI: holm oak woods with Viburnum (Quercetum ilicis galloprovinciale), evergreen oak groves (Quercetum mediterraneo-montanum), deciduous oak woods (Violo-Quercetum fagineae), shrubby oak woods (Buxo-Quercetum pubescentis) and Pyrenean oak groves (Cephalantero-Quercetum pyrenaicae). In addition, there are also small communities dominated by Scots pine (Pinus sylvestris), maritime pine (Pinus pinaster), black pine (Pinus nigra salzmannii) and Aleppo pine (Pinus halepensis). Of particular interest is the community of Pyrenean oak (Quercus pyrenaica), as it is the only one of its kind in Catalonia. Also of interest is the presence of the yew (Taxus baccata) and holly (Ilex aquifolium), as they are protected species. The lower elevations are mainly covered with grape vines, which have a strong tradition in La Conca de Barberà, for the production of local designation of origin wines and sparkling wines (cava). 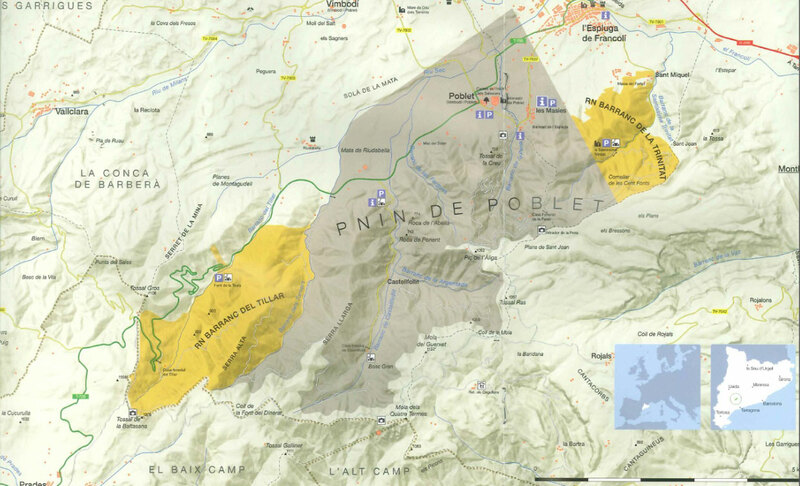 Poblet is a national forest with a long history and a long management tradition. Because of this reason its ecosystem services and stakeholders stretch out far beyond the local level. In the first half of the 20th century the forest was still very important for its provisioning services, mainly fuelwood and charcoal production. In the second half of the 20th century the coppice system in the broadleaved was abandoned and some parts of the forest were restored using pine plantations. In the last decades low incomes from wood and increasing labour costs have nearly stopped all tending practices. Occurrence of forest fire is a major disservice for Mediterranean forest in general, causing huge costs for prevention, control and aftercare. The biomass accumulation in the forest of Poblet during recent decades has increased the fire risk and observed fire damage. An ecosystem service of the NSNI which has strongly increased in recent decades is the recreation function. The forest is visited by cultural tourists, hikers, mountainbikers and mushroom pickers. The economic value represented by mushroom picking is undoubtedly the highest among its ecosystem services. Today the main management motivation is to maintain forest health and forest regeneration. The conservation and management of the forest is executed by a professional team of forest managers of the Generalitat. Because it is a protected area, they are supported by a management commission of stakeholders and experts. There is a long tradition of forest research in the area, which has certain interaction and effect on the forest management. The Generalitat has set up a pilot trial to regulate wild mushroom foraging in in the Poblet NSNI in order to enhance forest management and rural development. This is the first time that the Catalan government has regulated this activity and regulations shall apply to government-owned forests in an area that is highly popular among mushroom foragers. In accordance with the pilot scheme, foragers have to obtain a permit at a cost of 10 euro per season which allows them to forage for wild mushrooms in an area of 3,000 hectares. All money obtained will be directly reinvested in initiatives to improve the mycological habitat of the regulated area. What it the uncertainty of the outcome?